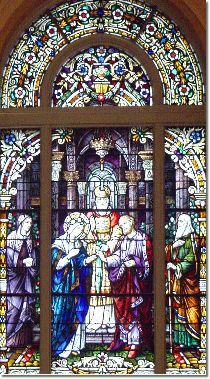 Upon Mary's completion of her stay in the Temple, she is betrothed to Joseph, as her parents Joachim and Ann look on. As was the custom of the day, this was an arranged union. In biblical times, a man and woman, before actually getting married, would become betrothed to one another in an official ceremony, comparable to what we would call the engagement period. During the betrothal time, the man and woman were actually considered married, so much so that to break off even a betrothal required an official decree of divorce. Normally the betrothed lived apart. Only later, during the actual marriage ceremony, would the man take his betrothed to his home. It was during the betrothal period that Mary received the visit from the archangel Gabriel, which is the next scene in our picture book.